Meet your neighbor Tina Brown Waterman of Strong-hurst. Tina was born in Burlington Hospital in Iowa, and grew up in Carman. She attended Southern schools, graduating from SHS in 1980. She graduated from Southeastern Jr. College in 1981 as a Medical Assistant. She worked for Dr. Robert Pogue two years, and then she ran a Day Care in her home for seven years. For the past twenty-three years, Tina has been employed at Burlington Medical Center, now Great River Medical Center working in the lab in histology. She processes fluid and tissue specimens and has had constant on-the-job training in the ever-changing field of medicine and medical care. GRMC is now undergoing a new computer system change throughout the whole hospital, that she will be learning. Her parents are the late William "Bill" Brown and Diane Fulkerson Brown. "Bill" was employed at J.I. Case Co., Burlington, Iowa, and was long-time chair of the local Henderson County Democratic party before his death from cancer. Tina's mother Diane Fulkerson Brown, a homemaker, wife, and mother, graduated from Stronghurst High School and moved this week from Carman to an apartment in Burlington, Iowa. Her one sibling brother Sheldon Brown of Owasso, OK, is a SHS graduate an studied aviation management at Southern Illinois University in Carbondale, and works at The Nordam Group. Grandparents are Isabelle (Vaughn) Brown and the late George Brown and the late Betty Combites. Her great grandparents were Duke and Julia Burrell who ran a motel in Bogis Hollow and noted for their eatery and delicious ice cream. Tina married Rick Waterman in 1982 at the Lomax Christian Church. Rick is the son of LeRoy and Ann Waterman of Stronghurst. Rick works at the IAAP for American Ordinance Plant in Middletown, Iowa. He has been there for 7 years and previously worked 17 years at EXIDE. They have four daughters including a set of twins. They are Jennifer (Chase) Gibb, Burlington; Jocelyn (Andrew) O'Daniels, Burlington; Hannah Adams, Burlington; and Danielle (Kevin) Clark, Fayetteville, North Carolina where Kevin is in the U.S. Army. Tina enjoys visiting her five grandchildren as much as possible: Hudson (5), Kya (4) Gibb; Maddie (4) and Nikko (20 months) O'Daniels; and Lillianna (4) Clark. 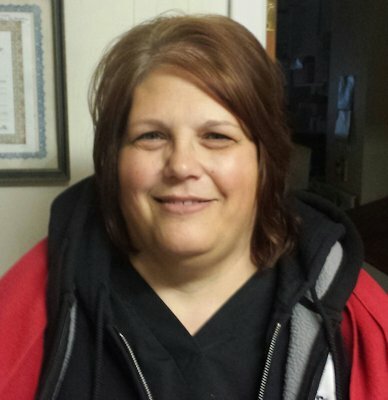 She also enjoys serving in the community as an EMT, a member of the Small School Pre School Board many years, PTO at Southern, a Girl Scout leader, and coaching summer softball along with her husband. She is a member of the Lomax Christian Church. Her vacations consist of visiting grandchildren and gardening. Highlights are seeing Danielle crowned Henderson County Fair Queen in 2006, and seeing her husband Rick win in the top three for his Christmas decorations of their home in Stronghurst. Tina would like to someday move to the country.